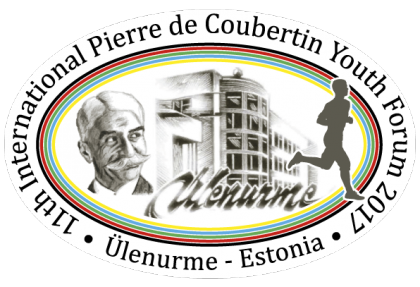 The International Pierre de Coubertin Committee (CIPC) and Ülenurme Gümnaasium present the 11th Pierre de Coubertin Youth Forum from 19th– 26th August 2017 in Ülenurme, Estonia. World-wide network of the Coubertin Schools, nominate seven students and one teacher to represent your school! We are expecting 30 delegations from 27 countries and 5 continents to attend the forum. Participating students should be between the ages of 16 and 18 and are expected to have learnt English or French as a foreign language for several years so that they are able to communicate within the international community of the 11th Forum. The participants of our 11th Youth Forum will not only have the chance to visit Estonia and to learn more about this young Baltic Republic. Besides enjoying the beauty of the landscape, they will also be able to meet and create friendships with the young people in Ülenurme. Participants are expected to take part in all events of the week’s programme without any exception. This especially applies to the participation in the competitions for the Coubertin Award, which was created in 1997. All students must carry out an activity in their respective country for the benefits of their community. Working with elderly people, coaching groups of young children in sports and any form of voluntary service are considered acceptable. Schools will receive cards for completion in advance, which should be signed by the Head of the school as a confirmation of each individual student’s successful participation. The cards must be brought to the Forum in August. All students will, as individuals, complete a short test (15 minutes) about the Olympic Movement. Questions will focus on the ancient and modern Games, the life of Pierre de Coubertin and the Olympic Games venues (summer and winter). These tests are designed in true Olympic spirit to promote participation. All students should have the opportunity to succeed with the appropriate amount of training and effort. At the 11thForum the tests will include some traditional events, like a 100m sprint,long jump, swimming, cross country race and ball throw from a sitting position (Paralympic sport). More details will follow later. forum motto (a performance, a song, collages, the forum banner etc.). In each workshop, there shall only be one student per nation. This way the participants will have another chance to meet and to mingle, this time in the artistic field. Lists for subscription according to the students’ talents or preferences will be sent to each school/delegation in a circular letter in good time before arrival. The central topic of our group discussions will be “Balance between Body and Mind”. Traditionally, there will be four subtopics. One of them the groups are expected to prepare in advance at home. This work will be supported by experienced members of the CIPC.The results will be presented during the closing ceremony and documented for the future work of the International Network of Coubertin Schools. Week will be filled with different activities: workshops, lectures, discussions, paraolympics, quizes, mini-expo, parade, performances, different sport activities. A ranking list will be set up after the race; about 15.30min for boys (5.10min/km) and 12min (6min/km) for girls. Long jump (We do not use a „take off zone“) 3 attemps. Correct take off! Ball throw (similiar rules to javelin). Total 3 attemps for each patricipant. Tug of war. – 6+1 members. 6 are pulling and 1 is a subtitute or cheerleader! Each full team, and mixed team (observer nations) are drawn to the groups. The size of the groups depends on how many countries will take part. After group stage starts play off stage. We offer almost every day multiple choises of sport activities for participants of the Youth Forum. streetball/basketball, football, indiaca, (beach) volleyball, some funny relay events. discgolf, orienteering, fitness/aerobics, nordic walking (for team leaders), table tennis. In every event there is a local instructor who will help and guide if necessary. Stay connected and “like” our Facebook page and use hastag : #CIPSyouthforumEST to show Your preparations for this summer!